Inclusive web sites. Books on world religions. Find a faith group that matches your beliefs. ReligionFacts provides provides free, objective information on religion, world religions, comparative religion and other religious topics. A group of essays prepared by Sociology classes at the University of Virginia lists many unusual faith groups. This is archived at: http://web.archive.org and is currently being migrated to the University of Waterloo. The new editor-in-chief is Douglas E. Cowan. John Bowker, "World Religions: The Great Faiths Explored & Explained," DK; Reprint edition (2006). Paperback and Library Binding. Read reviews or order this book safely from Amazon.com online book store. It received a rating of 4.3 stars out of 5 by 99 reviewers. Tim Cooke, Ed, "National Geographic Concise History of World Religions: An Illustrated Time Line," National Geographic; (2011). Hardcover format. Read reviews or order this book safely from Amazon.com online book store. It received a rating of 4.9 stars out of 5 by 15 reviewers. 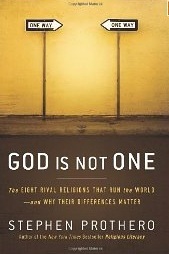 Stephen Prothero, "God Is Not One: The Eight Rival Religions That Run the World -- and Why Their Differences Matter," HarperCollins. (2010). Hardcover, Paperback and Kindle eBook formats. Read reviews or order this book safely from Amazon.com online book store. It received a rating of 3.8 stars out of 5 by 180 reviewers. John Renard, "The handy religion answer book," Second edition, Visible Ink Press, 2012. Read reviews or order this book from Amazon.com Paperback and Kindle eBook formats. The book compares and contrasts Judaism, Christianity, Islam, Buddhism, Hinduism, Confucianism, Taoism, and Shinto. It received a rating of 4.5 stars out of 5 by six reviewers. Houston Smith, "The World's Religions," HarperCollins, (2009). It "... provides sympathetic descriptions of the various traditions, explaining how they work 'from the inside'." Sales have exceeded 2 million copies! Read reviews or order this book from Amazon.com. Paperback and Kindle eBook formats. It received a rating of 4.3 stars out of 5 by 178 reviewers. U.S. Army, "Religious Requirements and Practices of Certain Selected Groups: A Handbook for Chaplains," was published in paperback format during 2001 for chaplains by the U.S. Department of the Army. It was republished in Kindle format during 2013. 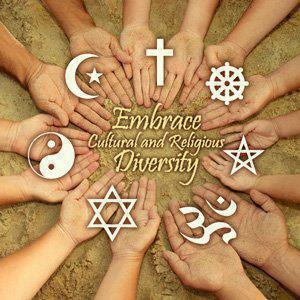 It describes dozens of faith groups: Christian, Islamic, Japanese, Jewish, Wicca, Satanism, Sikh, etc. Read reviews or order this book safely from Amazon.com. Paperback and Kindle eBook formats. It received a rating of 4.3 stars out of 5 by three reviewers. Starting at the top and moving clockwise, the symbols represent Christianity, Buddhism, Wicca, Hinduism, Jusaism, Taoism, and Islam. Information for these essays was extracted from reliable sources, and believed to be accurate and reasonably unbiased. Where possible, they have been reviewed by a group (typically of 3 or more persons) who follow the belief before the material is placed online. However, the entire field of religion is very subjective. Multiple, conflicting, and often mutually exclusive opinions abound. Before accepting anything on this web site that may have a direct impact on your own or somebody else's life, we recommend that you check out its validity with other information sources.